The National Investment Commission held its first Forum for the Iraqi – Korean Economic Cooperation on the 25th of February.2010 in Baghdad. The conference was attended by HE Mr. Nuri Al – Maliky, and more than 200 people of high officials and businessmen from both sides. The Iraqi Prime Minister said through his speech in the conference that Iraq has all the characteristics enabling it of providing comfortable life to its people, but; all wars, adventures and policies adopted by the previous regime had caused a massive destruction. Now all economic sectors and investment opportunities are available for the Korean companies especially in sectors like energy, power, housing and factories rehabilitation in addition to developing the military infrastructure. The prime Minister also stressed the importance of knowledge sharing and providing the training opportunities for Iraqi companies to gear up with the construction and rebuilding process. Dr. Sami Al- Araji – Chairman of the National Investment Commission said that having a Korean delegation of such high level represents the new trends Korea is taking in its relations with Iraq, Dr. Sami also announced the project of building 1 million housing unit to be implemented within the forthcoming 3 years in addition to the project of raising the power production capacity and other important investment projects. The Korean side was headed by HE Mr. Choi Kyung Hwan- Minister of Knowledge Economy accompanied with a big number of government officials and executive mangers of well known companies, the Korean Minister spoke about the most important economic issues that the prominent Korean companies are intending to start in Iraq in various fields like energy, power, oil, housing and heavy industries. The vision of both sides were united to come up with ways to achieve the economic growth in Iraq and reinforcing the bilateral relations through activating the role of the fruitful dialogue among businessmen of both sides starting from fields of common interest like developing the energy sector, construction, industrial facilities and infrastructure. The Korean side confirmed the great interest in reconstruction projects for the Southern Oil Company, roads, bridges, houses and hospitals in addition to preparing the major plans for the new Iraqi cities and their infrastructure when Hyundai Co. for heavy industries discussed with the representatives of the ministry of housing and construction supplying all equipments needed to reconstruct Iraq. It’s also worth saying that the Korean side had submitted so many consultations to the Ministry of Oil on how to go forward in the projects of upgrading Dora refinery and building new refineries. Hyundai Co. for heavy industries negotiated with the Ministry of Electricity to supply power packs. On the other hand, STX co. for heavy industries had signed a Memorandum of Understanding with the Ministry of Industry & Minerals to modernize Oil and petrochemical projects. The two sides reassured the mutual benefits for both of them through economic partnership in Korean investments in Iraq that will contribute to diversifying and stabilizing the Iraqi economy, they also stressed the importance of activating the regular contact and follow up of the results of this conference to speed up development, therefore; both sides agreed to foster the economic cooperation between Iraq and Korea and provide facilitated one stop shop services by the Iraqi side. On behalf of the National Investment Commission in Iraq, I would like to welcome you in Baghdad. Koreans are not strangers to this land; it is time to have you back. The first Korean workers arrived into Iraq in 1975 when Iraq was the most attracting among Arab countries to the Korean labor. South Korea achieved a special record in development and access into the global economic system. Its economy is classified as one of the top 20 in the world. We congratulate you for this enormous achievement and look forward to cooperate with you in all fields. As you know, Iraq is a rich county, but until this moment, did not utilize its potential resources. We have unlimited opportunities in all economic sectors. Investment law granted the foreign investor many chances and privileges and offered high level of independency to the provinces in granting investment licenses keeping the major strategic projects for the National Investment Commission. Business and investment environment in Iraq is in continuous change. Many legislations were issued including new laws for companies, banks stock change, financial management, purchases and the central Bank of Iraq. Iraq developed many of its strategy to lessen the government control on prices and establish procedures to restructure state owned companies. NIC and PICs are the executive parties to investment law number 13 for 2006 and its amendments. By following the OSS system, we work with the investor to finish all licenses and the required documents to gain the appropriate land for the project. 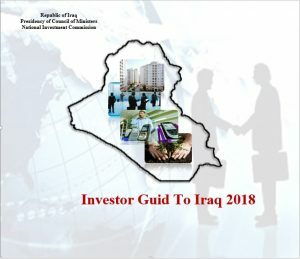 We do believe that the successful investment in various economic sectors in Iraq in addition to achieving the goal of the local and international investors in regaining their capital as early as possible with high rate of benefit, will directly affect the Iraqi citizen life style and the prosperity of the society in general. Housing sector: Iraq is working on attracting investors to build 500 thousand units in all provinces under concessional terms. We have offers from international companies and investors to build more than one million units under legal and financial term that are being prepared now in addition to the required land in each province including Kurdistan region. Electricity: international companies and investors submitted their offers to build energy production stations. They negotiated 24 thousands MW productivity. we are analyzing and negotiating the offers to choose the best terms for both parties. We are committed to do everything we can to ensure the launch of your investment project with strong steps because you have all success factors. I repeat welcoming you and thank you for participating in this first forum between our two countries. We thank H.E. Mr. Nuri Al Maliki for his great support and continues follow up to NIC work and goals in addition to his generous patronage to this forum. The World Bank is the fundamental institution in funding long term financing for development purposes, now, other institutions were created to work as the World Bank group including international funding and the international financing commission. Recently the multi parties’ agency was established to ensure investment. The international financing commission (IFC) is one of the World Bank branches which aim at activating the economic expansion and encouraging the creation of productive private institutions in the developing countries. Development and private investments in these countries should be allowed in addition to support their participation in the social and economic development. Accordingly, the institution was established in 1956 to represent the World Bank branch interested in developing the private sector. World Bank loans are allocated to governments because they work for the public sector so it was necessary to encourage the private sector by funding through contributions. The whole idea is based on shortage in organizers in the developing countries who can take project risks in addition to participating in establishing companies which encourages private sector to access investment. The IFC philosophy is selling its share in a company when this company is strong enough. IFC contribution is one type of promoting investment to develop an ongoing investment portfolio. All World Bank members can be members in IFC and can represent these countries in World Bank institutions. IFC included 106 members in early 80s. Each country has a representative and a vise in governors’ council. They share the same Board of Directors and Bank Chairman. This also applies to executive managers. The share value in IFC capital is one hundred thousand USD according to Article 2 which states the possibility of increasing the capital if most of the governors approve it if exceeding 10% of the capital, then 75% of the votes are required. All shares are to be paid in gold or USD. 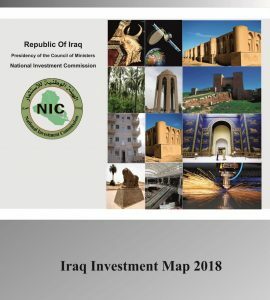 The National Investment Commission ended receiving lots of applications submitted by well-known Iraqi, Arab and foreign companies willing to participate in implementing the 1 million housing unit program (previously was 500 thousand housing unit) raised due to the big number of applications received as there were more than 98 interested investment companies . NIC is determined to coordinate efforts with the PICs to choose the lands required for the project while currently the commission is planning to negotiate applications submitted by all companies during the months (April, May and June). Dr Al- Araji confirmed that the planned number of the housing units will be distributed over all the Iraqi provinces including Kurdistan region, he also mentioned that each housing unit value will be 50 thousand dollars (approximately equals 59 million ID), Iraqis will have to pay a quarter of the price while the rest of it shall be paid in installments for ten years. The NIC board of directors held its 14th meeting in the 16th of March. 2010 during which the NIC latest variables were discussed. – Discussing the Legal department memo concerning the statute of specifying the lands prices. – Informing the board of the status reached for the strategic project of building 500 thousand housing unit. When the chairman explained the phases of the housing program and raising the total number of the housing units into 1 million due to the number of applications received by NIC. – Discussing tasks and duties of the Board of Directors according to the Investment Statute No 2 for the year 2009. Considering the National Investment Commission in cooperation with other ministries and departments involved in the implementation of its Kabaralamtnavs project to implement each of the UAE’s Bloom and architecture and melon company to build the city of the future, which includes 35,000 thousand residential units typical in Baghdad الدهنة district. The NIC is studying implementing Al- Mustaqbal City big project in cooperation with the concerned ministries and departments when several companies like Bloom, Al Bunyan and Alhandhal are competing to undertake the project consisting of 3500 housing unit in Al Dehna area in Baghdad. The National Investment Commission is expecting to receive a delegation of Egyptian companies within the few forthcoming months; the companies’ representatives who are interested in various investment sectors like housing, pharmaceuticals, textile industry shall meet with their counterparts from the Iraqi Public and Private sectors according to a memorandum of understanding to activate the economic cooperation between the two sides. On the other hand, NIC delegation visited Egypt in 6-18.Feb. 2010 to participate in the training course held in the Investment Ministry Leaders Center in Egypt to train government employees on developing and upgrading human capacities and other topics relevant to investment , insurance, securities and free zones. Dr. Ashraf – head of the center of the Egyptian Investment Commission opened the course with a welcoming speech followed by a thanking one by Mr. Abdul Razaq Alsaady and a brief for the 15-day program presented by Mr. Abdullah Al- Bander. Dr. Mahmood Muhyee – Minister of Investment, attended training course ending ceremony when he talked about investment in Egypt and his last visit to Iraq, Mr. Abdullah Al- Bander in turn thanked him on behalf of Dr. Sami Al- Araji – Chairman of NIC. The head of the National Investment Commission Sami Raouf al-Araji, the need to accelerate the implementation of the national program of housing project launched by the Commission in all provinces in the country and provide plots of land necessary for the implementation of the project. This came during chaired the regular meeting of the joint investment bodies in Iraq and stressed al-Araji, during the meeting the importance of drawing Alkharthalastosmaria new attention next to the housing sector and to give him the initial maximum among the projects set for the current year. Referring to the advantages achieved by the amendment to the Iraqi investment law and the need to take advantage of them and work out to attract and attract international companies to invest in all provinces in Iraq. also stressed the importance of accuracy in media statements and give the numbers and the real data to the media. For his part, General Manager of Muthanna Investment Commission that the share of the province of the project National Housing (11,000) housing units have been agreed with the Bank Iraqi Trade for funding also said that the Authority has allocated plots of land necessary for the implementation of the project, in cooperation with the local government in the province have been identified rent for those pieces with the Commission estimate their rent. it praised the Chairman of the National Investment role of Excellence Muthanna Investment Commission stressing the need to exert more efforts in order to build a new Iraq. Dr. Sami Al- Araji – Chairman of the National Investment Commission assured the importance of accelerating the implementation of the National Housing Program, that NIC had launched all over Iraq, and the necessity of allocating the lands required to implement the said program, This was mentioned during his heading the periodic meeting of the Provincial Investment Commissions in Iraq, he also asserted the importance of drawing up the updated Investment map and paying more attention to the housing sector with giving it the first priority for the projects planned for this year. Dr. Sami referred to the privileges provided by the investment law especially after the last amendments ratified by the Iraqi parliament and the importance of exploiting these privileges to attract the international companies to invest in all Iraqi provinces, He also insisted on giving the accurate numbers and information to Media. Muthana Provincial Investment Commission Chairman said that his province has to build 11000 housing unit, accordingly; an agreement had been signed with the Trade Bank of Iraq to fund implementing this project. Muthana Province also had been able to allocate the lands required in coordination with the local government of the Province with specifying the lease amount by the lease amounts evaluation Committee. Dr. Sami highly estimated the hard work Muthana provincial Investment Commission is doing, pushing towards paying more efforts to build the New Iraq.